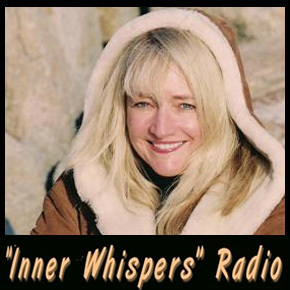 InnerWhispersRadio.com is current in 2018 and is related to the "Inner Whispers" newletter (get it free below). The radio shows feature messages and comments via a Causal Plane Entity. Each episode is recorded live with no commercials. The episodes are also available as free podcasts at www.InnerWhispersRadio.com. You can post comments or ask questions of the Entity, who is also featured in the free newsletter you can get below. The episodes are also carried on the iHeart Radio Network. ...And Thank You For Accepting This Invitation! "Inner Whispers" is a free spiritual newsletter that contains messages and answers to reader questions by a highly evolved nonphysical Entity and Spirit Guide that we call "VERONICA". 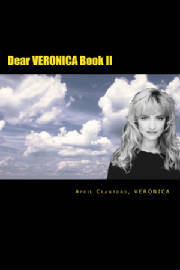 VERONICA is internationally well known and speaks to many people in the US and Internationally via April Crawford, who is a best selling author and one of the world's very few true full body open deep trance channels. 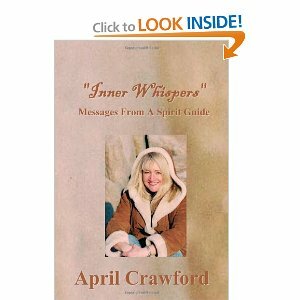 "Inner Whispers" is a free spiritual newsletter with messages and articles that are either written or dictated by evolved nonphysical entities and guides via Open Deep Trance Channel and Best Selling Author April Crawford. 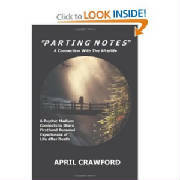 In "Parting Notes", for example, over 100 individuals have written via her hand to tell us about their "death" and afterlife experiences. Many of them offer information about lessons they learned that can greatly help us enhance our everyday physical living. Once you enter your e-mail address and name in the sign-up block above (and then hit the Submit Button) , you will immediately receive a fully formatted WELCOME e-mail. You will see the look and feel of "Inner Whispers" and it will also give you some of the details of what to expect in upcoming issues... including the "Dear VERONICA" column (VERONICA is a highly evolved nonphysical teaching entity and guide that consults with most of April Crawford's telephone clients)... and more. For more information about April Crawford, you can visit her website at www.AprilCrawford.com, or just use the navigation link on the left hand side of this page. Note: April Crawford is currently offering half hour and hour personal telephone consultations & readings with VERONICA.